OK, this time I contracted the flu BEFORE traveling, unlike getting it the day after returning home (from Catalina; see “Have Flu, Will Travel”). It was a sad occasion…the stomach flu hit me at about 12:30a.m. which technically was Esther’s 16th birthday. I began throwing up at 2:30 a.m. and my sister’s flight into Orange County was due at 8:10. Well she arrived, though Brian had to pick her up, but the saddest news of all is that Esther also contracted the insidious bug, and her entire birthday celebration has been postponed. My sister came and went like the wind, and I do believe I even caught a glimpse of my brother, bedside, for a few minutes. Though our porcelain queens aren’t getting nearly the attention they did yesterday, our stomachs are still making sure to keep us close to their thrones. Anyway, I leaving in the morning, as planned, with Cole. 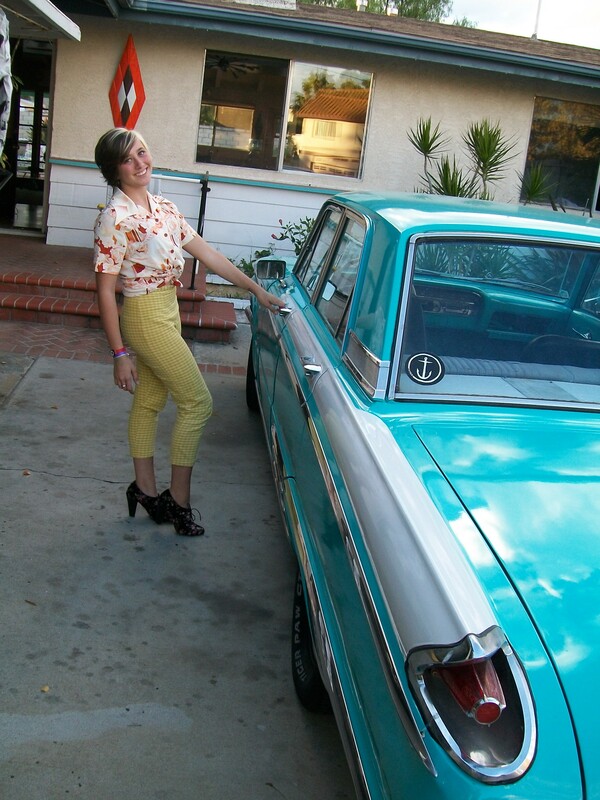 But I leave YOU with a gorgeous photo of Esther on the eve of her birthday, with her new 1962 Mercury, and a smile still on her unsuspecting face (unsuspecting of the flu that is). …please keep us in prayer for safe travels, and please PRAY FERVENTLY FOR A POSITIVE OUTCOME WITH THE ACUPUNCTURE TREATMENTS. As always, I thank you! My baby's got a Mercury! May you and your family find blessings heaped upon you more so than you imagined – and may miracles be a way of life that your own life proclaims the truth of. And may it start today – with safe travels north and prosperous effects of eastern medicine. After arriving at your door on Saturday with flowers for Esther, I can attest to your unfortunate and dismal state. Wouldn’t wish it on anyone that’s why I followed your advice and only ventured as far as the front step. Continued recovery and safe and successful journey this week. BTW, love that smile and pose in front of the Mercury. Look out, that adorable face and that vintage car can only mean eager young men will come a calling.